For the second time, the four pillars of the “Steyler Family” met in Steyl last weekend on Palm Sunday. It was for all the participants a good opportunity for learning by doing together how one can live communally the vocation, the baptism and the mission. Much could be written or said in conferences or sermons about the fact that there are four groups in the “Steyl Family” which traces its origin to Steyl and St. Arnold Janssen. Not to be forgotten were the four lively children who were among the participants. Their spontaneous and natural curiosity, their joy in helping to prepare the candles and the palm fronds and serving at liturgical celebrations benefited us all-knowing adults and insiders a lot. 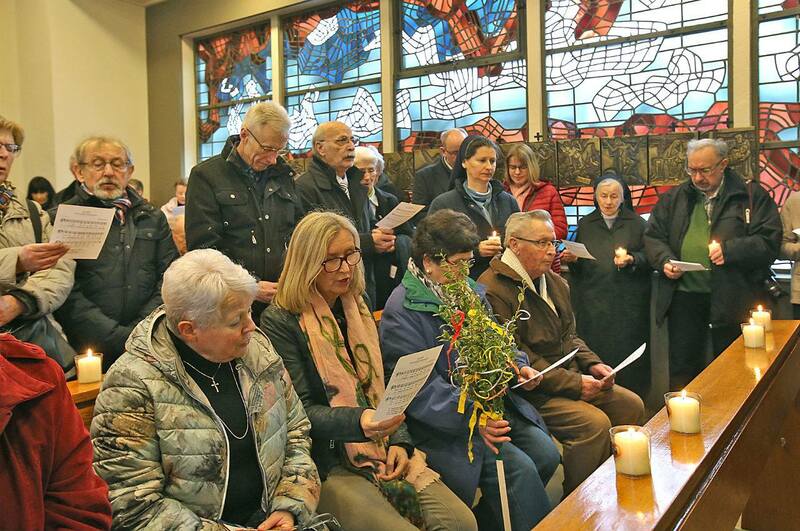 The climax on Saturday was the “procession in remembrance of the passion” in which some guests who arrived just for the occasion as well as Sisters, Brothers, Fathers from the convents in Steyl and the vicinity participated. Close to 150 persons moved through Steyl, called the “convent village”, sometimes praying at other items singing or in silence. The point of departure was the side chapel of the Sacred Heart Convent (SSpS) with the sarcophagus of the two Blessed Helena Stollenwerk and Hendrina Stenmanns. Sr. Mechtilde Berger SSpS, in a brief reflection, showed with which trust in God the two co-foundresses of the Steyl Missionary Sisters faced crosses and sufferings in their own lives and in the origin and growth of the congregation. Some of their sayings were read out by participants as an encouragement for persevering in difficulties because God is there and cannot be outdone in magnanimity. With these words directed to today’s situation the procession started moving in the direction of the Holy Spirit Convent where the Adoration Sisters were already waiting in the chapel. In common prayer before the Blessed Sacrament, the presence of Jesus under the veil of bread, the Adoration Sisters together with the pilgrims recalled the Last Supper. In spite of the grill of the cloister the common unity could be sensed. Leaving the Adoration Sisters the procession continued on its way through the Steyl convent gardens, with the sun shining and a light wind blowing. While praying the rosary the pilgrims in a fraternal/sisterly and caring gesture repeatedly passed on the light whenever the wind had blown it out. The procession paused briefly at Calvary scene with the Cross before reaching its goal in the lower church of St. Michael’s. There beneath the cross of the resurrection was the painting entitled “God becoming human and suffering”. It was painted by Br. Othmar Jessberger SVD, who worked in Indonesia for many years. In a reflection on this painting Fr. Rudiger Brunner SVD referred to the deep question of God and suffering. “Suffering does not exist in spite of the coming of God, he said, but God came because suffering exists.” Subsequently, at the sarcophagus of St. Arnold, the four candles (Missionary Priests and Brothers, Missionary Sisters, Adoration Sisters, Friends and Partners) were lighted. Here, near the father of the Steyl Family, all those present received a blessing for their Christian life, in whatever form they may be living it. On Palm Sunday the women and men of Steyl moved together even more closely and celebrated the liturgy which contributed further moments of experience to the overall theme of “procession in remembrance of the passion.” Part of this were the cordial and personal greetings addressed to the gathered Steyl Family by Fr, Martin Ueffing, SVD, provincial superior.